Linda Knock, volunteer and Friend of Hylands House, tells us a little about the history of Hylands House in Chelmsford during the First World War. I wonder if V Festival participants will appreciate the rich history of the house and its inhabitants. Our research comes under two headings – ‘Hylands Military hospital and the people who were there’ and ‘The Men of Hylands who served in the Great War’. Our task was to find ‘the stories’ of these men. For both lots of research the Widford Choir books in the Essex Record Office and the local newspapers in the British Newspaper Archive proved invaluable. We have also been helped by the families of the men we have found. By building trees on Ancestry and putting a post there, I am in contact with the descendants of three men, and have been helped by a member of the Family History Society of Queensland [Australia] – I posted a request on their Facebook page and the following day one of their members went for a walk in the cemetery in Brisbane and found the family’s grave, including a mention of the soldier who died at Hylands. The emails to the local papers unfortunately did not produce any results, but the piece in the Friends of Hylands House newsletter found the descendant of one local soldier. Information from Luckings, the funeral directors, was very useful. An Australian war grave for Samuel Barrow, a patient in the hospital who was presented with his Military medal on the ward, and then was sent home to Australia. We were pleased to discover that Sir Daniel Gooch made the bedside lockers for the wards when the ground floor of his house was made into a hospital; first used by the 2nd and 3rd South Midland Field Ambulance Corps, then for Belgian soldiers and British soldiers. Many of the latter were from Scottish regiments and the local newspaper at the time of their arrival at the Hylands Halt on the railway said “Several Scottish regiments were represented, but as they were all in khaki it was difficult to distinguish their regiments.” There were also soldiers from Canadian and Australian regiments and I have to admit it was easier to access their records than those over here [and at no cost]. From over 1500 men who were treated at Hylands we have only 9 names from the local newspapers. But from those names we have found their families and their stories. One success already was the cleaning of the war graves in St Mary’s Churchyard in Widford. I was very upset when I visited the graves in November last year to find they were green, so I emailed the Commonwealth War Graves Commission and was pleased to find that when I returned in April that they are in their original condition. At the time of the Great War the Hylands Estate was not the park as we know it now, but a huge estate including many of the farms around – Widford Hall, Skeggs, Montpeliers, Webbs, Elms and many others, so the task was huge. We decided to find out as many names as possible from the 1911 census and the 1918 voters list [ERO]. There were many men who were the right age, so we have a list of names, but are concentrating on producing the stories of a few. We decided to include Widford as it was so close to Hylands and many of the men attended, or were choristers at St Mary’s Widford. The stories we have chosen so far are those of Lancelot Gooch of Hylands House, two brothers who went into the Army and the Navy at 16, a soldier and his wife who both died of influenza just after Peace was declared, a gamekeeper who lived in one of the Estate lodges, and a soldier who lived in one of the Causeway Cottages that belonged to the estate. If anyone reading this has information about soldiers who were treated at Hylands Military Hospital, or those who were from the Estate, please get in touch. The results of our research will be displayed in the House at the event on 14th and 15th September. 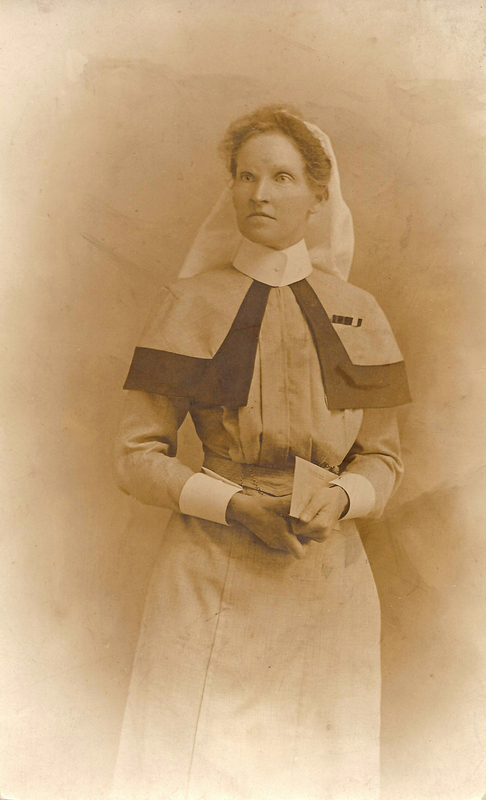 The letters of Essex nurse, Kate Luard are due to be published this month, so 100 years on from the day that she enlisted in Queen Alexandra’s Imperial Military Nursing Service Reserve, here is some more about our Essex heroine, from her Great Niece and editor of the new version, Caroline Stevens. The words of Unknown Warriors resonate as powerfully today as when first written. The book offers a very personal glimpse into the world of WW1 nursing where patients struggled with pain and trauma, and nurses fought to save lives and preserve emotional integrity. This photograph is of Kate in her QAIMNSR uniform which appeared in the Parish News of Birch, Layer Breton & Layer Marney in November 2002. The book’s author was one of a select number of fully trained military nurses who worked on ambulance trains and in casualty clearing stations during the First World War, coming as close to the front as a woman could. Kate was already a war veteran when she arrived in France in 1914, aged 42, having served in the Second Anglo-Boer War. At the height of the Battle of Passchendaele, she was in charge of a casualty clearing station with a staff of 40 nurses and nearly 100 nursing orderlies. She was awarded the RRC and Bar (a rare distinction) and was twice mentioned in Despatches for gallant and distinguished service in the field. Through her letters home she conveyed a vivid and honest portrait of war. It is also a portrait of close family affection and trust in a world of conflict. In publishing some of these letters in Unknown Warriors her intention was to bear witness to the suffering of the ordinary soldier. ‘It is a tale of heroism, modestly told, but unsurpassed in interest by any War novel yet written’ Field-Marshal Viscount Allenby. Introduction co-authored by Christine Hallett, Professor of Nursing History at the University of Manchester, and Tim Luard, former BBC Correspondent and great-nephew of Kate Luard. Postscript including unpublished letters both from Kate to her family and those to her in France. Produced by her own family the revised edition offers a fitting tribute to her remarkable work. The original letters written by Kate and those to her from her family are held in the Luard archives at the Essex Record Office, Chelmsford. You can find out more on the website: http://kateluard.co.uk or search our blog archive for more. There will be many events and plenty of TV coverage to keep us all informed of what happened 100 years ago, and we will be encouraged to ‘Remember’, to look back and reflect, to weigh up what that war means for us today. For me, I know that one of my great grandfathers, Frank Bernard Lane, served for his country and although I never knew him I appreciate what he sacrificed for us, although I do know that he survived the Great War, unlike many of his friends, I suspect. I have read many stories of bravery from our wonderful project researchers and have been impressed at the willingness of men and women to step into the unknown and risk their lives for the ‘greater good’. I hope you manage to have a look back through our archived blog posts to discover some of the stories. I also hope you get a chance to see the touring exhibition, when it is ready from September 2014 onwards, at your local museum or library, where you can read more fascinating stories. We were pleased to present the first of five completely original poems written by local poet, Luke Wright. He has taken the research given to him by our project manager, Tony Morrison, from our volunteer researchers, and turned it into a wonderful, reflective poem about what was going on in Essex, 100 years ago. Please do read it and let us know what you think. In addition, the Essex Record Office and our partner museums have begun to work on education sessions or resources for secondary schools. Chelmer Valley High School, in Chelmsford has already held an art competition in conjunction with both the Essex Fire Museum and the Essex Police Museum. You can see their art work on our Project Partners: Schools page. If you get a chance, do have a look at the EROs most recent blog post: ‘And so the mad Dance of Death has begun’: a look at the Essex County Chronicle of 7 August 1914, which is an extensive look at the Essex Chronicle’s reports from 100 years ago. Following on from our previous blog post, we return with another guest, writing about his family from Wickford, James Nason. My family haven’t really got very far. I can trace them back to my 10th Great Grandfather, Richard Carter, in Wickford thanks to a document from St. Catherine’s Church that is held by The Essex Record Office. Over 400 years later I live Pitsea, a short journey away from Wickford. The Carter’s have been a massive influence on Wickford and still are to this day. One of these was my Grand Aunt, Queenie Thorrington nee Carter. She was born, in Wickford, on 8 April 1910. Queenie spoke to author Jim Reeve, who went on to write ‘Wickford Memories’, about her memories of the First World War. Her father, my Great Grandfather, Halbert John Carter was employed at docks as a carpenter and a joiner, converting ships to troop ships. He wasn’t healthy enough to join the armed forces and he was kept on as a carpenter at the docks even after hostilities had ended. Hubert, Pearl and Queenie Carter. Taken around 1917. Her mother, Daisy Ethel Carter, nee Bewers, had two older brothers that fought during the Great War. 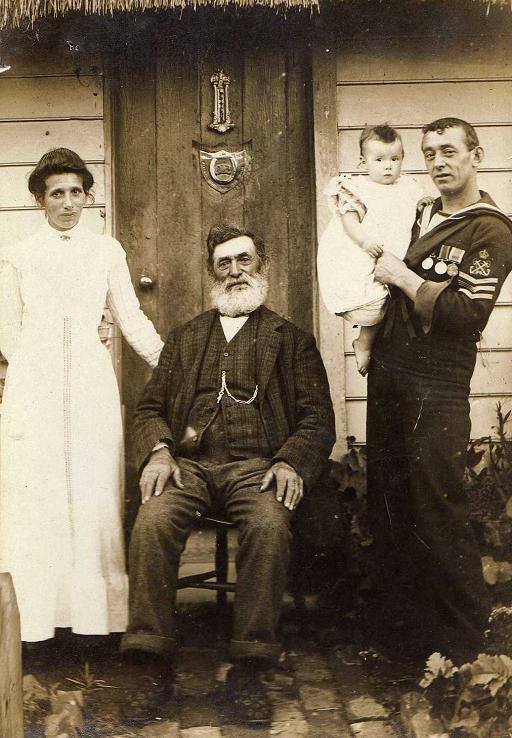 William John Cornelius Bewers (known as Will), born 5 May 1876, was a career sailor and had joined the Royal Navy before the turn of the 20th Century. 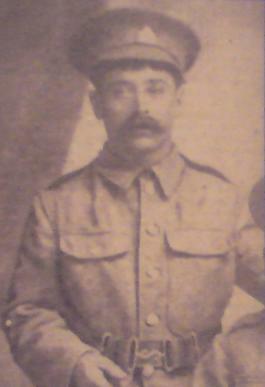 Henry Robert Bewers (known as Bob), born 7 May 1877, joined the army in 1916. 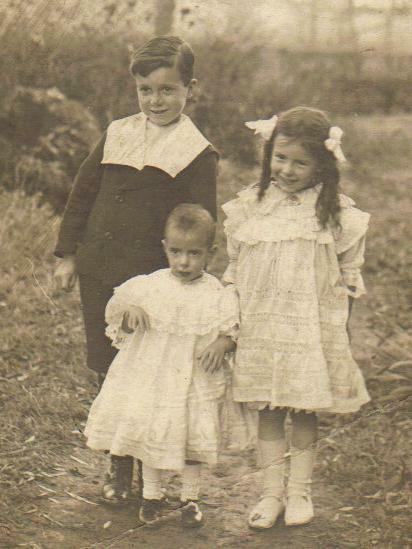 Ada Carter (nee Bewers), William Bewers and William John Cornelius Bewers carrying Queenie Carter, 1911. William was a Chief Stoker on HM Submarine E22. The submarine was part of a naval experiment. It carried two Sopwith Seaplanes on its casing that would be floated and then sent to intercept Zeppelins. The experiment was eventually abandoned. Whilst on surface manoeuvres, off of Great Yarmouth, on 25 April 1916 his submarine was torpedoed and sunk. Only two men survived and uncle Will was killed. Less than a year before this he married Eva Grange. She wrote to the admiralty asking for information as he was originally just listed as missing. I can’t imagine she got to spend much time with her new husband and the little news she received after he went missing must have been awful. Aunt Queenie can remember seeing what she thought was the whole British army marching through Wickford, and up towards Runwell. I was told a story that one of those soldiers was uncle Bob, that he waved to my aunt and was disappointed that she never recognised him. Henry Robert Bewers, a Private in the Second Battalion, Suffolk Regiment, was killed 18 August 1916 in Cochrane Alley, Guillemont, France. He never married. Queenie died, January 2009, aged 98. If you’d like to tell us about your Essex family and their experience of the First World War then get in touch. 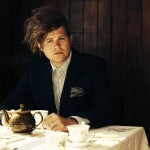 We love having guest blog writers! Written by Curator, Jennifer Brown. Braintree District Museum is one of the partner museums working with Essex County Council on their project ‘Now the Last Poppy has Fallen’. 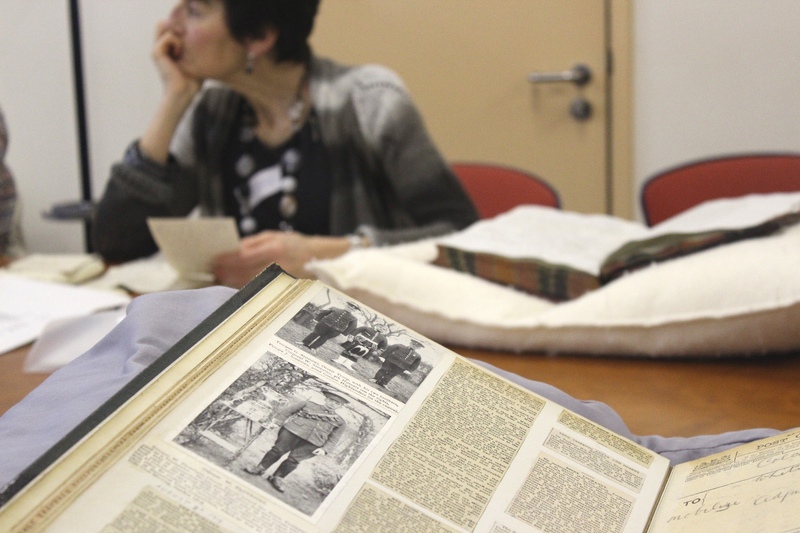 This project aims to research the impact of the First World War on the lives of individuals, families and communities in Essex. It will result in a touring exhibition reflecting on stories from the Essex Home Front, develop museum education sessions for schools and reflective school performances and commission artists to produce performances relating to these stories. The museum is very excited to be a part of this project. 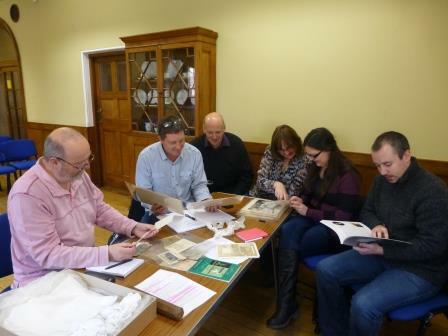 The project group look at Braintree District Museum’s World War I archive. Yesterday, Tony Morrison, Co-ordinator of the Essex-on-Tour programme and Project Manager of the Last Poppy project, and five local volunteers visited the museum to view our World War I archive. The group enjoyed looking through the highlights of our collection, including a nationally significant collection of documents and photographs relating to the East Anglian Munitions Committee. Led by Francis Crittall and Mr Stokes of Ransomes and Rapier Ltd., this committee steered a group of 42 local industries who between 1915 and 1918 produced a total of 5 million shells as well as many other important products for the war effort, and dramatically drove down the costs of production. This high turnover at low prices made a massive contribution to the government’s shell supply and helped to save the lives of many troops on the front line. Prior to the establishment of the Committee each gun crew was limited to 5 shells per gun, which led to the death of many of our troops. 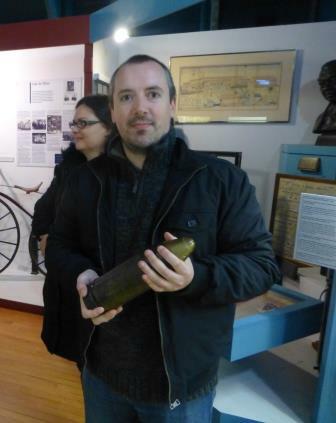 Below is a photograph of volunteer Chris holding one of the 18lb shells produced at the Crittall factory at Braintree. Other highlights include postcards sent from many different World War I battle zones, and ID papers of men enrolled on vital war industries locally and who were therefore exempted from military service. 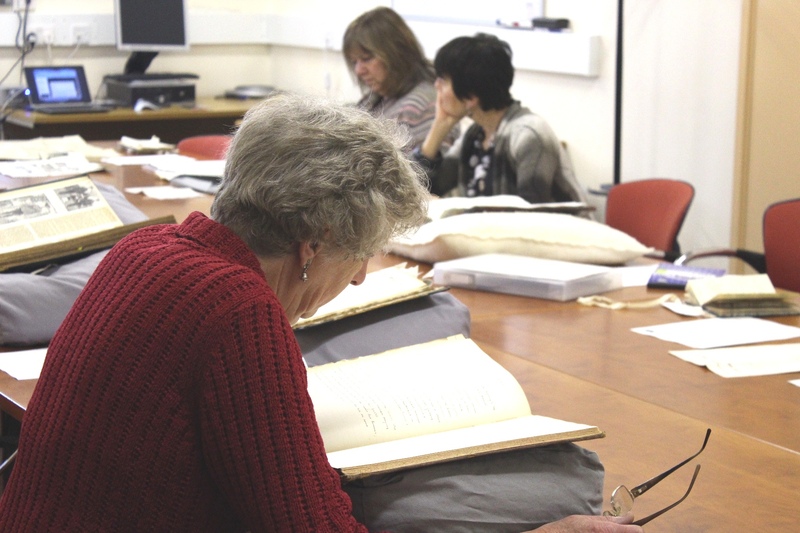 The volunteers have chosen some exciting initial research topics, including first-hand accounts of the Zeppelin raid on Braintree in 1916 and the voluntary war work of Margaret Mercer, Ariel Crittall’s mother, behind the lines in France. However, we are still looking for more stories about life on the Home Front and the impact of the war on the people of Braintree District. If you have any information, artefacts, or stories to share please do get in contact with us. You can contact the museum by phone, 01376 325266 or by email, info@braintree.gov.uk. Time is ticking onwards and research for the Last Poppy project should be underway. Some of our volunteers attended the Essex Record Office on the morning of Wednesday 18th December to find out how to use the county archive. 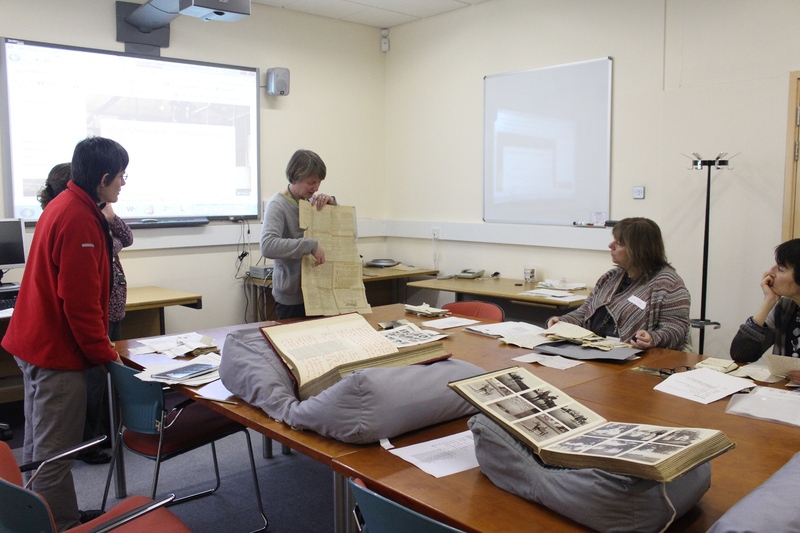 Archivist, Allyson Lewis and Audience Development Officer, Hannah Salisbury gave volunteers a tour of the ERO including a visit to one of the store rooms, helpful advice on how to use the online cataloge ‘Seax‘ and an introduction to original documents. An interesting set of documents, that Allyson produced for the volunteers, was some letters written to and from nursing sister Katherine Luard, daughter of Bixby Garnham Luard. She was born in 1872, and served in the Boer War and First World War. She was awarded the RRC, the Royal Red Cross for her military nursing service. Katherine included a hand-drawn sketch of her living quarters, a tent she was staying in at the time. The Luard family documents can be found by searching on Seax, reference D/DLu. 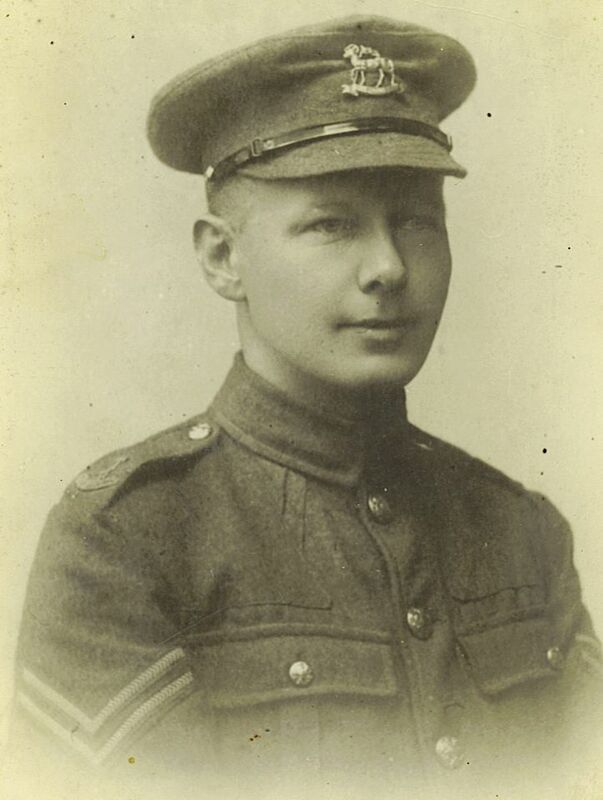 We welcome blog post submissions from anyone with stories from Essex during the Great War. See the guidance above for further information.